Over the past month I've been hitting excessive thermal heating on my laptop and kidle_inject has been kicking in to try and stop the CPU from overheating (melting!). A quick double-check with older kernels showed me that this issue was not thermal/performance regression caused by software - instead it was time to clean my laptop and renew the thermal paste. 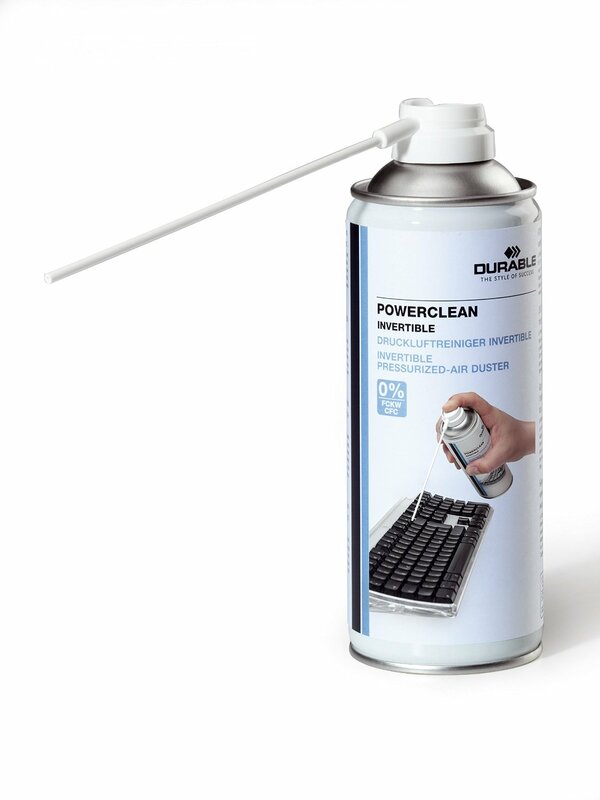 After some quick research, I found that Artic MX-4 Thermal Compound provided an excellent thermal conductivity rating of 8.5W/mK so I ordered a 4g sample as well as a can of pressurized gas cleaner to clean out dust. The X230 has an excellent hardware maintenance manual, and following the instructions I stripped the laptop right down so I could pop the heat pipe contacts off the CPU and GPU. I carefully cleaned off the old dry and cracked thermal paste and applied about 0.2g of MX-4 thermal compound to the CPU and GPU and re-seated the heat pipe. With the pressurized gas I cleaned out the fan and airways to maximize airflow over the heatpipe. The entire procedure took about an hour to complete and for once I didn't have any screws left over after re-assembly! I normally take photos of the position of components during the strip down of a laptop for reference in case I cannot figure out exactly how parts are meant to fix on the re-assembly phase. In this case, the X230 maintenance manual is sufficiently detailed so I didn't take any photos this time. I'm glad to report that my X230 is now no-longer overheating. Heat is being effectively pumped away from the CPU and GPU and one can feel the additional heat being pushed out of the laptop. Once again I can fully max out the CPU and GPU without passive thermal cooling mechanisms being kicked into action, so I've now got 100% of my CPU performance back again; as good as new! Now and again I see laptop overheating bugs being filed in LaunchPad. While some are legitimate issues with broken software, I do wonder if the majority of issues with the older laptops is simply due to accumulation of dust and/or old and damaged thermal paste. Over the past few months I've been adding several new stress tests and a lot more stressor options to stress-ng for Ubuntu 16.04 Xenial Xerus. I try to track new system calls and features landing in the kernel and where appropriate add a stress test to try and force out bugs. 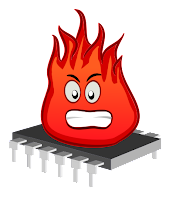 Stress-ng has found various kernel bugs, such as CVE-2015-1333 and LP:#1526811 as well as bugs in user space (for example, daemons crashing) when memory pressure is very high. Simple abusive tricks, such as aggressively trying to allocate every free page in memory are useful in finding drivers that don't necessary check for memory allocation failures. For example, today I was caught out when a USB ethernet dongle driver didn't check for a null pointer due to an allocation failure and stress-ng ended up triggering a kernel oops (fortunately, this bug was fixed in a recent kernel). The underlying philosophy for stress-ng is "use and abuse standard Linux interfaces and see how far we can push them to destruction". I'm pretty sure there are plenty of creative folk out there who can dream up dastardly ways to make stress-ng even more stressy, so contributions are always warmly accepted! 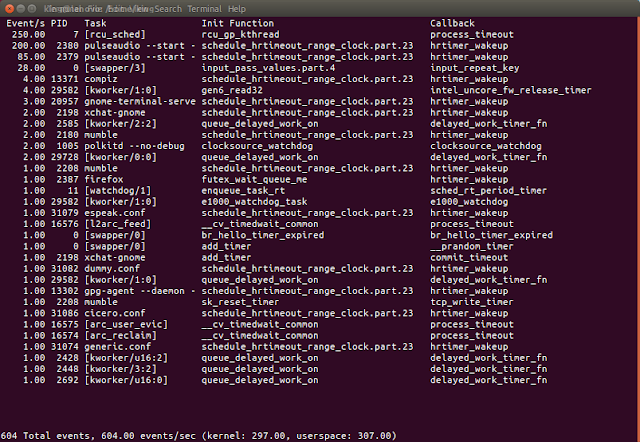 I have a mirrorred copy of the git repository on github to make it easy for developers to get their hands on the code. We've been using stress-ng on ARM based SoC kernels to force out bugs and this has been useful in finding areas where non-swap based systems break. 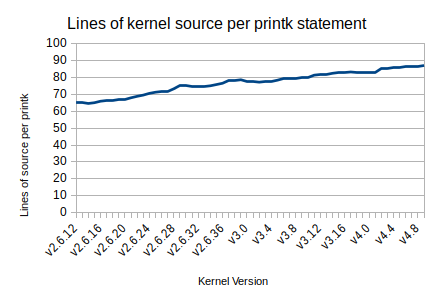 You really don't want your kernel oopsing or processes segfaulting when a IoT device has run low on memory. My original intent for stress-ng was just to make a system run hot and force thermal overruns. However, I soon discovered it is useful to force kernel bugs out by attempting to (pathologically) thrash most of the system calls. I've also added perf stats to stress-ng to track performance of standard stress scenarios over kernel versions to get an early warning of any potential performance regressions. 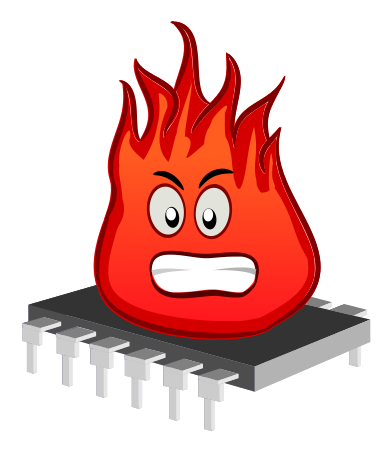 So stress-ng is a bit of a mixed bag of stress tests and performance measuring goodness. When I get some free time I hope to run stress-ng against a GCOV instrumented kernel at see how much test coverage I get on a kernel. 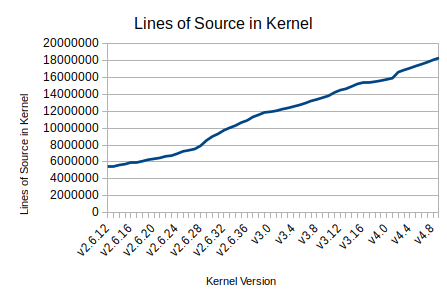 I suspect there are a lot of core kernel functionality still not being touched by stress-ng. I've also tried to make stress-ng portable, so it can build fine on GNU/Hurd and Debian kFreeBSD (with Linux specific tests not built-in of course). It also contains some architecture specific features, such as handling the data and instruction cache as well as the x86 rdrand instruction and cache line locking. If there are any ARM specific features than can be stressed I'd like to know and perhaps implement stressors for them. 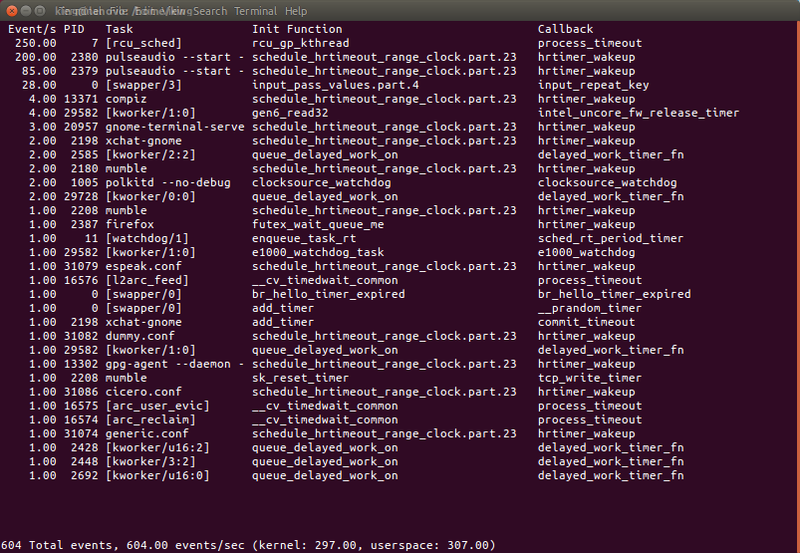 Anyhow, I believe stress-ng is almost feature complete for Ubuntu Xenial, however, I expect it to grow in features over time since there is always new functionality landing in the Linux kernel that needs to be thrashed tested. 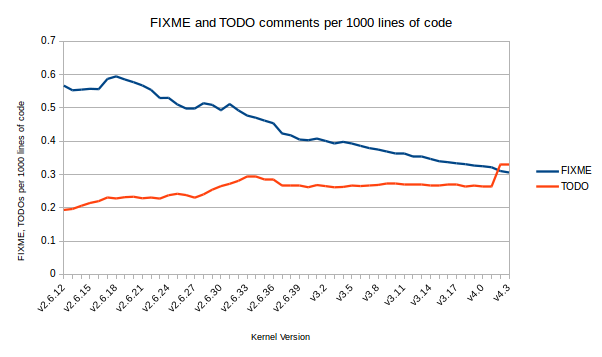 While looking at some code in the Linux Kernel this morning I spotted a few FIXME comments and that got me wondering just how many there are in the source code. After a quick grep I found nearly 4200 in v4.4.0-rc8 and that got me thinking about other similar comment tags such as TODO that are in the source and how this has been changing over time. 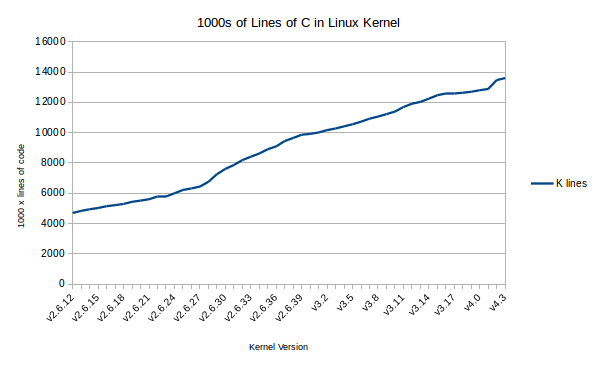 Note: Data gathered using sloccount on the lines of C in the kernel source. 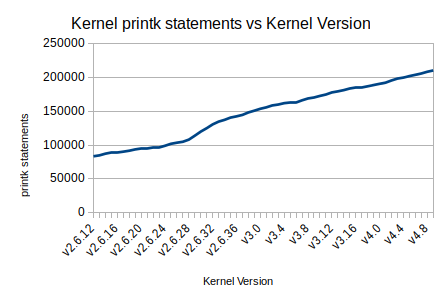 So FIXMEs are actually dropping in relative terms to the size of the kernel where as TODOs are increasing. 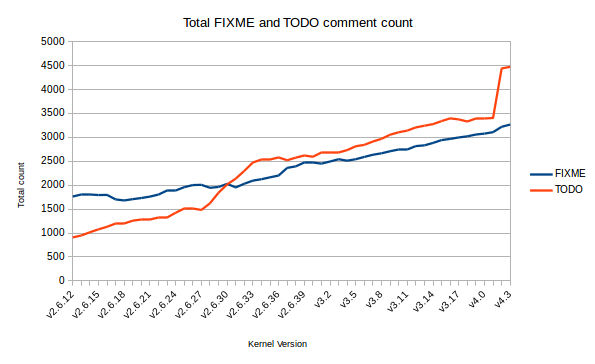 Of course, these statistics are bogus because it is dependent on kernel developers adding and removing FIXMEs and TODOs in a consistent manner, however, it is interesting to see how many comments exist and hence how much work has been tagged in comments as work to be done later. I wonder how this compares to other large open source projects.